Divoom unveils Voombox Bluetooth speakers | What Hi-Fi? The new Voombox range consists of the Travel and Outdoor speakers and both sport rugged, durable bodies with Bluetooth wireless connection. 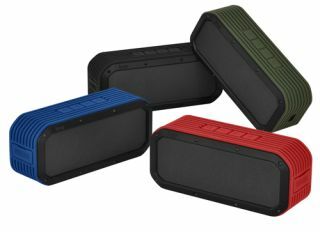 Speaker manufacturer Divoom has unveiled a new range of Voombox wireless speakers: the Travel and Outdoor models. The Voombox Travel is a small, portable design with a ring clip for securing to a belt or bag. The 4W Bluetooth 4.0 speaker is covered by a rugged, splash-proof casing making it ideal for outdoor use. A 550mAh rechargeable battery is also onboard to provide up to six hours of playback. Users are also able to make and take phone calls through the Voombox Travel thanks to a built-in microphone. The Divoom Voombox Travel is available now in indigo blue, army green, vermillion red and smart black for £50. A second Bluetooth speaker has also been announced: the Voombox Outdoor. Like the Travel, it features a rugged, water-resistant body and Bluetooth 4.0 technology. The Voombox Outdoor offers 15W of output power and features two 2in drivers, one tweeter and two passive radiators. A rechargable 3200mAh battery is onboard to provide up to 12 hours of playback and as with the Travel, the Outdoor features a built-in microphone for hands-free calls. The Divoom Voombox Outdoor will be available from the end of May in black, white, red, pink and blue for £100.